Are you swimming in the nip dear reader? This week we share some ideas with you about a what the State Pension looks like currently, how much we might get, how we go about qualifying for it, and how the level of income we have from 'guaranteed sources' when we do retire determines how we can access other retirement funds we have set for ourselves.......so a nice simple one!! Welcome to Ireland's only dedicated and straight-talking Financial Planning and Personal Finance Blog & Podcast. We are on a mission to share insights and to help people to help themselves. In return if you feel it is of value to you then please do tell a friend! We'd love to hear from you with any feedback, suggestions or questions, drop me a mail here. Ireland's State Contributory Pension is a payment made to people over 66 based on their social insurance contributions. 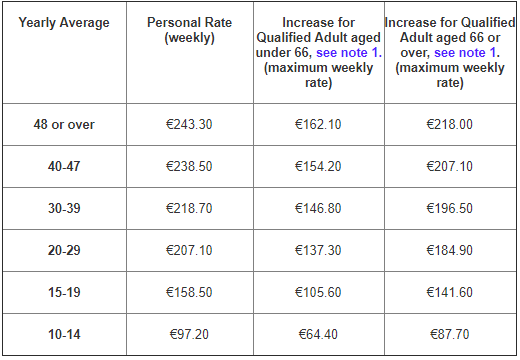 The full pension was recently bumped up by €5 per week, and now stands at €243.30 per week, which if you are used to monthly figures totals at €1054.30 per month. I'm led to believe that unlike many other countries where your pension entitlement is determined by the level of your wages whilst working, in Ireland that ain't the way it's done. So now that we have that cleared-up, how do I go about qualifying for the state pension, and ensuring that I get as much of as I am potentially due....well the simple answer is that you have to pay your way. What Age Can I Get The State Pension? On this one it pays to be older! If you were born between Jan 1949 and Dec 1954 you can apply to get it from 66. So basically if you are 64 or 65 you can get it soon! If you were born between Jan 1955 and Dec 1960 then it will be 67 before becoming eligible, and if you were born after 1960 it's 68 years of age for us! How Do I Qualify For Contributory State Pension? Many of us will be paying 'Pay Related Social Insurance' (PRSI) and it is this 'Social Insurance' is what goes into one big pot and is used to pay (or at least goes some way towards paying!) the retirement benefits of those who have contributed and then subsequently transition, or a lovely word we heard recently, 'graduate' from full time employment! Depending on what type of work you do and your employment status you will pay a different type of PRSI, or a different 'stamp' as some people like to call it. There are currently 11 different PRSI classes, and which one you are paying may determine which type of social insurance benefit you may receive.....it is all very complex, and the party-line from most bodies is that we contact the local tax office if we are in any doubt, and indeed this is fair guidance as for the most part the local tax offices are super helpful in guiding you, could save you days of online searching if you get talking to the right person! An interesting aspect to all of this is that the benefit you get is predominantly dependent on the number of contributions you make (before hitting 66 years of age). The number of contributions equates to the amount of weeks work you did essentially. Interestingly, a week, for PRSI purposes is a now Monday to Sunday. This might seem obvious but for anyone who is job-sharing or on part-time work this can be pretty significant. Let's take for example a teacher who is on job-share for 6 years. If the job-share arrangement meant he was working Monday-Friday one week and was then off the following week this would mean he was paying contributions on only every second week. If however he was working a few days every week that would mean he is paying contributions every week, and therefore getting much closer much quicker to qualifying for his full state contributory pension, twice as quick as if he was working week on and week off! So it is worth checking this for yourself or mates of yours that might fall foul and be doing themselves out of retirement income! There are lots of nuances involved in all of this, and if in doubt as mentioned already it can be really helpful to get in touch with your local revenue/tax office or check out revenue and citizens information websites, chock-full of info! How Much PRSI Need I Pay To Qualify? In order to work out approximately what rate of pension you will you can run some simple arithmetic.......a simple case of division! Divide the number of contributions you have made since you started working, up until your reach 66, and divide that total number of week by the number of years between the year you started paying contributions/working and the year before hitting 66! Lets take Jimmy, now 65, and has worked on and off all his life since 18 years of age. His first contributions were 48 years ago, and he has paid 1300 contributions. Dividing one by the other we get a number of 27. Using the chart below we can therefore see that Jimmy would be entitled to approximately €207 per week. If Jimmy had only made 600 contributions over that period, for whatever reason, his weekly benefit would be €97 per week, which would be far from a great income. So we can see that the more time-off where we are not paying contributions will reduce the benefit we get, under the current model. If however you take time off to look after children under 12 the 'gap' in this instance is not to be factored in the calculation, and so you should not miss-out based on these periods of non-contribution. For all the T&Cs on qualifying for the state pension this is a great resource here. It is worth noting that there is a move afoot towards a 'Total Contributions Approach' (TCA) for people retiring after 2012, and being introduced in some way in 2018. This will allow an individual to be assessed under both methods and ultimately to avail of the better of the 2 calculations. This TCA approach is one which looks at number of years of contributions as opposed to weeks and assessed the total contributions as opposed to averages. With this new approach a person will supposedly need to have 40 years of contributions in order to qualify for the max benefit, and if you have less than 40 you will get 1/40th for each year contributions....which would potentially make it more manageable! The anomaly that has existed for many years in this area, and one that has impacted many people, is that fact that even the full state contributory pension has not been enough to unlock people's ability to access in a meaningful way their pension benefits. If you qualify for max benefit of €243.30 it equates to €12,651, which while a reasonably decent amount of money falls short of the minimum guaranteed income of €12,700 which one needs in order to avoid having to lock away €63,500 of their pension funds until they reach 75 into an Approved Minimum Retirement Fund. Yes they can draw 4% of this income per year, which amounts to a whopping €200 per month or so. The challenge for many has been the fact that they may have reached retirement with a fund of say €100,000, thinking it would be a great pot of money to get on their retirement, only to discover that they need to lock the majority of it away until they are 75. For many people they may have been misinformed or were under an illusion that a pension is a gift-wrapped lump of accessible cash as soon as they retire, it ain't! The restriction of the €12,700 only adds to the trauma. If a person has substantially more retirement funds but does not have the minimum guaranteed annual income of €12,700, say they have €12,000) you could argue that they could buy an annuity in order to generate the additional €700 needed to remove the need to put €63,500 into an AMRF? You could argue that, indeed they would only need to use approx €17,000 to buy an annual income of €700 with a 4% annuity. However many providers have minimum amounts on annuities, and it could represent terrible value for money for a purchaser. Yes they are saying that the next increase or two in state pension will mean that if someone qualifies for the full pension they will have €12,700 secured from that source, however there will be many people who won't qualify for the full pension, and may face the shock of having to lock over €60,000 into an AMRF! Finally, an update that happened in recent months means that people can include their Christmas Bonus State pension payment (which for instance last year was 85% of your weekly entitlement) will be allowable in calculating your guaranteed income, and therefore potentially unlocking the need to keep your funds in the AMRF. Again, it will impact some and not others. We are all well primed at this stage for the pension benefit to reduce over the years and for it potentially to become payable at a later age than currently set up to do. I do hope that the above will at least get your thinking about what lies ahead for you and what this all means for you. We are also well primed to start our own pensions to compliment what will likely be a retreating state support, however there are still supposedly approximately less than half of us who have some sort of a pension. I hope for all our sakes that the 50% who don't have got some sort of a plan, because as you can see from the above figures, even if you do qualify for the Full Monty, when the tide goes out we will see who has been swimming in the nip! !